Due to weather issues in past years, the 2019 Book Festival will be held inside Mercer Area Middle/High School. We will be right inside the front doors along the hallways for easy access and plenty of parking. As always, this event is free to the public. Thank you to Principal Piddington and to the school board for allowing use of the school! We will be on for Saturday, July 21st at Brandy Springs Park, working around a possible shower or two. Thank you to Mercer Library for offering us space as a contingency plan. Look for small group events to be held there in the future. The Who's Hangry Food Truck will be at the festival serving lunch from 11:30 - 1:30. The Mercer American Legion Auxiliary will be selling hoagies and drinks most of the day. Local singer Jewel Ullrich will be performing at the 2018 festival from 11 am to 1 pm. Trish Wordan of Groom 'N Dors in Mercer has agreed to attend the 2018 festival, so little ones can come read books to an appreciative dog. January 2018: The 4th Annual West PA Book Festival will be held on July 21st from 10 am to 4 pm at Brandy Springs Park, Mercer. March 2017: The 3rd Annual West PA Book Festival will be held on July 22nd from 10 am to 4 pm. We have a change of venue this year and will be at Brandy Springs Park in Mercer rather than at the Courthouse. May 2016: Mercer Mainstreet will be hosting a craft/vendor show along with the farmers market during the festival. Included will be book-related crafts. April 2016: We have an official photographer! Denise McCoy of Mercer will be documenting the festival for our website. July 28: We now have a Facebook page for continuing coverage of our local author events plus literacy information and reading links. July 27: The Record Argus did a feature story, with photos, on the Festival. Thank you to the area newspapers for being so supportive of the event! July 22: We are on the front page of the Sharon Herald! Read it HERE if you missed grabbing a print copy. July 15: We are on the front page of Greenville's Record Argus today! Be sure to pick up your copy. June 25, 2015: We have an Event Page on Facebook! Check us out for literacy articles and event information. 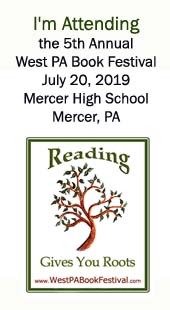 The 1st Annual West PA Book Festival will be held on the Courthouse Lawn in beautiful Mercer, Pennsylvania on July 25th, 2015 from 10 am - 4 pm (some of our authors may be set up by 9 am). We plan for this to be a growing yearly summer community event to support/encourage literacy and reading and to provide book lovers with new reading choices. Come meet our authors, all local to the west central PA region, and get a book (or 2 or 3 or 4...) signed personally to you! Our rain date is the following Saturday, August 1st, but we will not change it for a normal amount of PA drizzle. If there's a date change, we'll post it here the day before the event. Make plans to stop by and bring your friends, book lovers or not. Converts always very welcome.